With the forecast track for newly-formed Tropical Storm Nate drifting closer toward New Orleans, city officials are warning residents to prepare for a threat of heavy wind and other possible effects of bad weather. Today, Mayor Mitch Landrieu, along with City Officials, provided an update on Tropical Storm Nate. 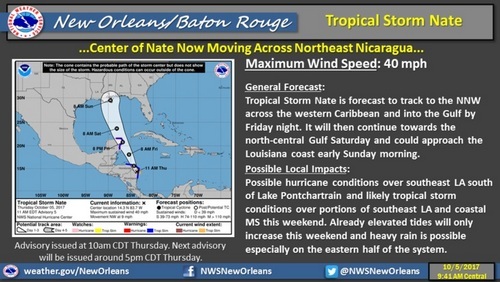 Today, Nate was upgraded to a tropical storm and has taken a significant westward shift, making probable landfall in Southeast Louisiana over the weekend. The chance for tropical storm-force winds has increased. Heavy wind is currently the primary concern for New Orleans through the weekend. At this time, a Coastal Flood Advisory is in effect for New Orleans until noon on Sunday, Oct. 8. Coastal flooding is expected as tides are up to two ft. above normal tide levels. Potential storm surge flooding is probable through Saturday and Sunday. There is also potential for minor flooding of low-lying roadways outside of the flood protection system, near the Lakefront and in the Venetian Isles area. The Sewerage and Water Board (S&WB) is working closely with New Orleans Office of Homeland Security and Emergency Preparedness and the Mayor’s office to monitor Tropical Storm Nate. S&WB and its contractors continue to work around the clock to repair all power and pumps to stabilize and strengthen the City’s drainage system. Since August, S&WB has repaired six drainage pumps and two turbines. Today, 108 of 120 drainage pumps are fully operational. Turbines 1, 3 and 6 are available for service with additional power being provided by 26 backup generators which were mobilized under emergency declaration. Additionally, S&WB is in the process of installing five Electro-Motive Diesel Generators at the Carrollton Water Plant and are scheduled to be available for service in the coming weeks.